"Ostensibly, this [Government proposals] is to stop migrants sponging off the state. Government statistics, however, show foreign-born people are less than half as likely to claim benefits as those born here"
Yesterday the Home Secretary, Theresa May, announced that new rules on family migration will require UK citizens to earn at least £18,600 in order to bring a spouse to the UK, with the threshold rising when children become involved. The move sparked contoversy over whether the measures could create legal clashes with article 8 of the European Convention on Human Rights, which guarantees a right to respect for private and family life. Columnist Ian Birrell also criticised the proposals this morning, asserting that foreign nationals were actually far less likely to be claiming benefits than those born in the UK. The most recent statistics on benefit claims by foreign nationals were published by the Department for Work and Pensions (DWP) in January this year. The analysis examined benefit claimants based on their nationality at the point of receiving their National Insurance (NI) number. "These statistics do not provide a measure of non-UK nationals currently claiming benefits based on their current nationality. The statistics do provide an estimate of the number of people currently claiming benefit who, when they first registered for a [National Insurance number] (that is, first entered the labour market), were non-UK nationals." 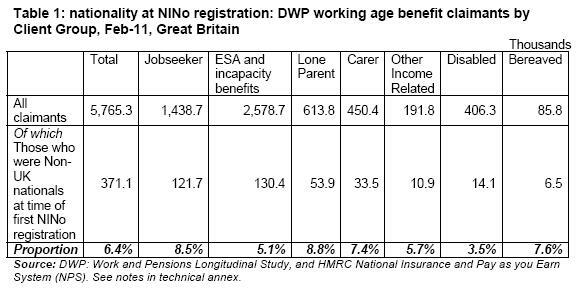 "As at February 2011, 16.6% of working age UK nationals were claiming a DWP working age benefit compared to 6.6% of working age non-UK nationals (at the time they first registered for a National Insurance Number)." 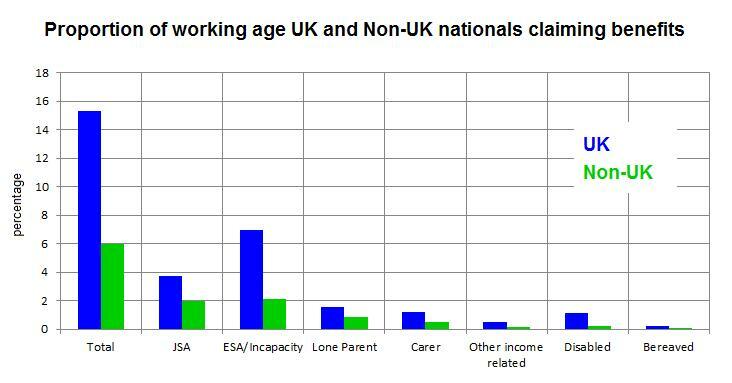 This indicates that, based on data from National Insurance numbers, UK nationals are around two-and-a-half times more likely to be claiming working age benefits than non-UK nationals. However the DWP report does not explain any of the detail behind these figures, nor do they break down the proportions into different benefit types. Instead, they cite working age population figures from the Office for National Statistics (ONS) as the source. Thanks to this citation, we can piece together how the DWP arrived at its conclusion. Examining the ONS data on the working age population by country of birth shows that there are just under 41.5 million people of working age in the UK. Of these, 35.2 million were UK-born and 6.2 million were foreign nationals. From this, we can calculate that, based on the latest ONS population estimates from 2010, just over 15 per cent of UK nationals were claiming working age benefits. This compares with around six per cent of non-UK nationals. This provides some indication of where the DWP's estimates come from, however again these figures are based on less than reliable NI number registration data and so aren't a perfect measure of the current claimant count among foreign nationals. In spite of this, further evidence also indicates that foreign nationals are less likely to be claiming certain types of benefits. Back in September last year Full Fact looked into claims made by the Daily Express that migrants were "more likely to claim unemployment benefits". This claim was both inaccurate and ignorant of guidance provided by the Department for Communities and Local Government, who found using data from the Labour Force Survey that migrants were in fact less likely to be claiming unemployment benefits specifically than UK-born nationals. However, these figures too carried a warning of reliability, this time based on a small sample size of foreign nationals. The notion that foreign-born people are less than half as likely to be claiming benefits as UK nationals is well founded in the available figures from the DWP and the ONS. They indicate that around 15 per cent of UK nationals are currently claiming working age benefits, compared to six per cent of foreign nationals. However these figures carry a warning from the DWP that estimates of foreign-born working age benefit claimants are limited in that they only present nationality as it was when those people registered for their NI number, not necessarily as it is at the moment. So while the evidence supports the claim, we shouldn't necessarily take the evidence as a precise reflection of foreign benefit claimants in the UK.